Returning for their third album in Don’t Be Long, Make Do and Mend from Hartford Connecticut were originally placed in the same kind of bracket as Touche Amore and La Dispute (splits and tours with these bands as well as appearances and covers of songs may account for this). However for me this is a band that fits into the ‘scene’ but with a distinctly different sound to their contemporaries. There is a clear sound to the band, and as soon as opener (and title track) ‘Don’t Be Long’ kicks in, you know this is a Make Do And Mend record. Front man James Carroll has a gruff rough voice that fits in perfectly with the broody riffs. Carroll manages to tow a fine line between melody and scream, and pulls it off with great success. The thing I find most apparent about this (and for that matter any MDAM record) is the relentless energy that is displayed throughout; ‘Bluff’ and ‘Ever Since’ are excellent examples of this. Make Do And Mend offer something different, with a certain rawness about their songs, which is evident on Don’t Be Long. For me Don’t Be Long sticks true to the roots of End Measured Mile and Everything You Ever Loved, albeit with a more polished and accomplished sound, without removing the raw emotion that you get from those two records. ‘Old Circles’ is potentially a place where someone less into the style of music may find an easy entry point, and ‘Each Of Us’ is also quite accessible. ‘Sin Miedo’ and ‘Sin Amor’ are two songs that come up with something unexpected and different, with instrumentation that does something different to many bands in the scene which coupled with Carroll’s vocals makes for a couple of killer tracks. ‘I Don’t Wonder At All’ is an acoustic chance to show off another side of Carroll’s vocals, changing the pace of the album nicely. Closer ‘Begging For The Sun To Go Down’ is a more emotive softer song that shows off the talents of the band and gives a pretty great summary of where Make Do And Mend are as a band. In terms of a stand out track; it has to be ‘Bluff’ but in truth I can tell already this is a record I will go back to and find new songs that stand out for me. 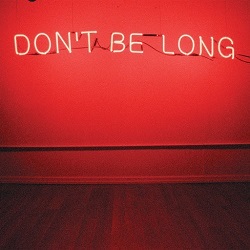 Don’t Be Long is a great continuation of good work from this band, Make Do And Mend continue to put out raw emotive music that is packed with great music and lyrics.